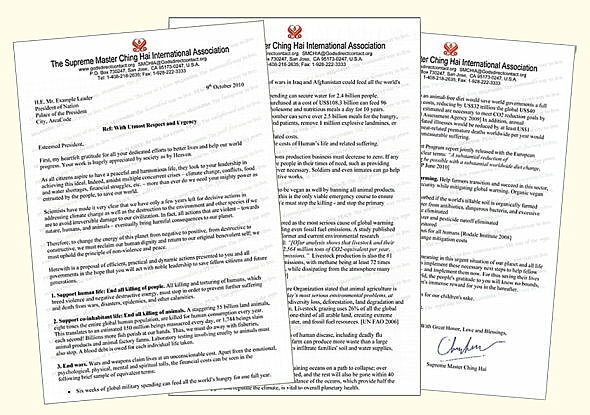 To create a common vision of an organic vegan world and provide practical steps on how to realize such a vision, Supreme Master Ching Hai recently sent another letter to all government leaders around the world, urging them to move in the same positive direction of peace and love, away from all forms of destructive actions and policies. In a short time, many government officials from countries like Australia, Canada, United States, Guyana, Hong Kong, Formosa, United Kingdom and Formosa have responded, expressing support and appreciation of Master's initiative. Here are a few selected responses. Member for Maylands, Parliament of Western Australian Legislative Assembly, Ms. Lisa Baker MLA, kindly replied to Master, saying, "Your three proposals of efficient, practical, and dynamic actions that you hope will lead to governments working with their citizens to uphold the principles of peace and non-violence are a noble effort." She further noted, "I am a proud vegetarian and an animal welfare advocate and I do understand the need to implement steps that move towards a sustainable society for all humanity, our animals, and our environment." She also attached a copy of her inaugural speech delivered in November 2008 which shows her commitment to public service and the well-being of the people. In supporting the same ideal, Ms. Clover Moore, Parliamentary Member for Sydney, highlighted her work to achieve environmental protection, including biodiversity and protection, food security and encouraging people to grow their own food at home and in community gardens. 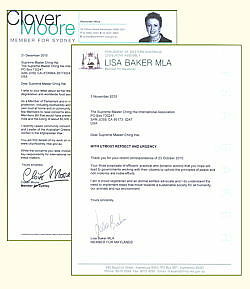 She wrote, "In the NSW Legislative Assembly, I am one of the few Members to raise concerns about animal cruelty and animal welfare, and introduced a Private Members Bill that would have prevented the sale of mammals in pet shops in order to stop pet mills and the killing of about 60,000 unwanted animals each year in NSW alone." Mr. Ludwig Follner, Head of Citizens Service, Federal Chancellery of the Republic of Austria, sincerely thanked Master for showing appreciation of Federal Chancellor Faymann for his efforts to improve the citizens' lives and to advance progress in all areas in Austria and in other countries. He pointed out, "The Republic of Austria, in the country's core values, has promised peaceful coexistence and is well-known worldwide for its humanitarian attitude, as can be seen in uncountable relief operations. This is just to show some of the essential, basic prerequisites for a peaceful, appreciative coexistence of society, which also contains treating with care nature and nature's resources which are at our disposal." 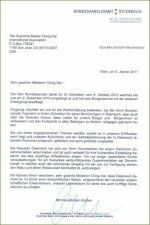 He concluded, "We can assure you, dear Master Ching Hai, that Austria is making efforts, as in terms of a modern nation, according to most recent scientific studies, to preserve our habitat for this generation and also for future generations." On behalf of the Premier of Newfoundland and Labrador, Canada, Minister Charlene Johnson wrote that Newfoundland and Labrador understand the urgency of the climate change issue, and have taken actions to tackle the crisis. In addition, the province would be represented at the COP16 in Cancun. 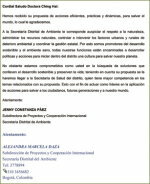 Ms. Jenny Constanza Paez, Deputy Director of Projects and International Cooperation of the District Department of the Environment in Colombia, expressed her gratefulness for receiving Master's proposal about efficient, practical and dynamic actions to save the world. She said their department is committed like Master in search of solutions involving sustainable development and preserving life. They will share Master's proposal with the District Health Secretariat as well. In conclusion she stated, "This is for us to act as leaders in the implementation of actions to save people, future generations, and our world." 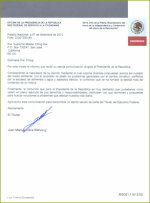 The President of the Committee on International Relations and Foreign Trade as well as a member of the Legislative Assembly of San Jose, Costa Rica, Mr. Chacón wrote that Master's proposal is "consistent with many of the efforts being made in Costa Rica for the dignity of human beings, promoting a culture of peace, and the protection of wildlife, key aspects for the preservation of the planet and the improvement of the quality of life for our people." He wishes Master every success in this noble movement. With great enthusiasm and high respect, Senator Tony H. Otto of the Federated States of Micronesia wrote to Master, "I got your letter from my friend Floor Leader Joe Suka and loved to read it very much. Please put my name on your distribution list for I want to learn more about those things that damage our environment and wish to do my best to join those of you who have been attempting to change the mindset of the world leaders to one of supporting our environment." The Office of the President of the Republic of China (Formosa) acknowledged that Master's letter has been presented to President Ma and Vice President Vincent Siew respectively. It's written, "All the while, your Association has been advocating the vegan diet to protect the environment for sustainable development. Your endeavor is truly admirable . . . . We are very grateful for your valuable suggestions and sincerely hope that we can continue to strive together for the sustainable development of our Earth." With wholehearted support, Mr. Chairil Abdini, Deputy for Minister of State Secretary for Policy Support, informed Master that Her letter has been extended to the President of the Republic of Indonesia. 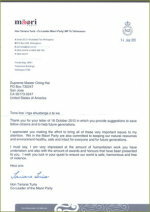 "We are very grateful that your various articles concerning "Be Veg, Go Green 2 Save the Planet" will be used as a source of inspiration for our government in dealing with climate change issues." He sent his best wishes for Master's good health and success. 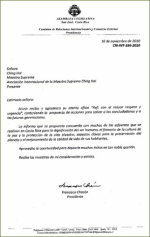 On behalf of the President of Mexico, Mr. Juan Manuel Llera Blanco from the Federal Network of Citizen Service, Office of the Presidency of the Republic conveyed His Excellency's regards. 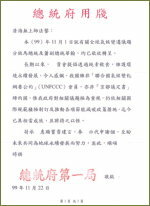 He acknowledged the receipt of Master's letter which contains various proposals to address urgent issues in the world. He said that the President encourages people to exercise their full rights and responsibilities as does Master, and to participate in solving problems that affect our daily lives by voicing their opinions and proposals. Ms. Hon Tariana Turia, Co-Leader of the Maori Party, expressed appreciation for Master's efforts to bring these very important issues to her attention. She said, "We in the Maori Party are also committed to keeping our natural resources and environment healthy, safe, and intact for everyone and for future generations." She added, "I must say, I am very impressed at the amount of humanitarian work you have undertaken and also with the amount of awards and honours that have been presented to you. I wish you luck in your quest to ensure that our world is safe, harmonious, and free of violence." The Maori Party is a political group in New Zealand founded in 2004 that seeks to claim the ownership of the foreshore and the seabed of the Maori people, to defend their rights and to preserve their history. The Policy Officer of the Energy Directorate, Climate Change Division, Mr. Craig Thomason thanked Master on behalf of the First Minister of the Scottish Government for Her letter about climate change. He affirmed that the Scottish Government is committed to reducing emissions of greenhouse gases in Scotland by at least 42 percent by 2020, and at least 80 percent by 2050. 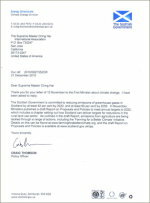 He further noted that in the newly published draft Report on Proposals and Policies to meet annual targets by 2022, "emissions from agriculture are being tackled through a range of actions, including the 'Farming for a Better Climate' initiative." Mr. William Brady, the 44th District of Illinois State Senator, USA, thanked Master for Her sufficient and thoughtful insights and said he especially enjoyed Her views on organic farming. He welcomes any additional, useful material sent to his office and is willing to provide any assistance to our organization. 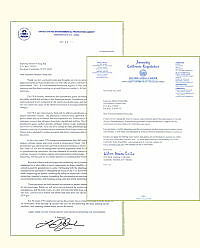 Ms. Wilmer Carter, the Assembly Member of the 62nd District in California, USA, agreed that the environment is one of the key areas that needs improvement and she will keep Master's thoughts in mind as the next legislative session is upon them. 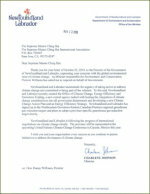 From the US environmental Protection Agency, Ms. Lisa Jackson appreciates hearing from people like Master who take an active interest in the future of our environment. She noted that combating global warming is one of her seven top priorities and cited the rules that were recently announced to address the issues of greenhouse gas. We thank all the government officials who courageously and publically support the green efforts and take action to implement policies that will lead the public to the path of sustainable living and long-term peace. We thank you, on behalf of the animals, the Earth and our future generations. First, my heartfelt gratitude for all your dedicated efforts to better lives and help our world progress. Your work is hugely appreciated by society as by Heaven. As all citizens aspire to have a peaceful and harmonious life, they look to your leadership in achieving this ideal. Indeed, amidst multiple concurrent crises—climate change, conflicts, food and water shortages, financial struggles, etc. —more than ever do we need your mighty power as entrusted by the people to save our world. Scientists have made it very clear that we have only a few years left for decisive actions in addressing climate change as well as the destruction to the environment and other species if we are to avoid irreversible damage to our civilization. In fact, all actions that are violent—towards nature, humans, and animals—eventually bring harmful consequences to our planet. Therefore, to change the energy of this planet from negative to positive, from destructive to constructive, we must reclaim our human dignity and return to our original, benevolent self; we must uphold the principle of non-violence and peace. Herewith is a proposal of efficient, practical, and dynamic actions presented to you and all governments in the hope that you will act with noble leadership to save fellow citizens and future generations. 1. Support human life: End all killing of people. All killing and torturing of humans, which breed violence and negative destructive energy, must stop in order to prevent further suffering and death from wars, disasters, epidemics, and other calamities. 2. Support co-inhabitant life: End all killing of animals. A staggering 55 billion land animals, eight times the entire global human population, are killed for human consumption every year. This translates to an estimated 150 million beings massacred every day, or 1,744 beings slain each second! Billions more fish perish at our hands. Thus, we must do away with fisheries, animal products, and animal factory farms. Laboratory testing involving cruelty to animals also must stop. A blood debt is owed for each individual life taken. ˙ Six weeks of global military spending can feed all the world's hungry for one full year. ˙The actual and projected costs of wars in Iraq and Afghanistan could feed all the world's hungry for 67 years. ˙Two weeks of global military spending can secure water for 2.4 billion people. ˙One month of global weapons purchased at a cost of US$108.3 billion can feed 96 million hungry children three wholesome and nutritious meals a day for 10 years. ˙ The cost of a single B-2 stealth bomber can serve over 2.5 billion meals for the hungry, restore the sight of 31 million blind patients, remove 1 million explosive landmines, or build 713,000 new family homes. ˙ Not included are the huge war-related costs. ˙Not included are the unredeemable costs of Human life and related suffering. Therefore, wars must be ended. The weapons production business must decrease to zero. If any armies are even retained, they should serve people in their times of need, such as providing disaster relief and rebuilding homes wherever necessary. Soldiers and even inmates can help people plant vegetables or do other productive work. 4. Start a vegan diet. Help co-citizens to be vegan as well by banning all animal products. This is not dictating personal lifestyles; this is the only viable emergency course to ensure the survival of humans and the planet. We must stop the killing—and stop the primary cause of climate change. Animal factory farms are also a known origin of human disease, including deadly flu pandemics. [US CDC 2009] A single factory farm can produce more waste than a large city; and its bacteria, hormones, and antibiotics infiltrate families' soil and water supplies, untreated. In addition, fishing practices have put life-sustaining oceans on a path to collapse; over 70% of the world's fish species are fully depleted, and the rest will also be gone within 40 years. [UN FAO, UNEP 2010] Restoring the balance of the oceans, which provide half the world's oxygen and regulate the climate, is vital to overall planetary health. Furthermore, the global change to an animal-free diet would save world governments a full 80% of greenhouse gas mitigation costs, reducing by US$32 trillion the global US$40 trillion costs Dutch scientists have estimated are necessary to meet CO2 reduction goals by 2050. [Netherlands Environmental Assessment Agency 2009] In addition, annual health care expenses due to meat-related illnesses would be reduced by at least US$1 trillion, and more than 20 million meat-related premature deaths worldwide per year would be prevented, as would families' immeasurable suffering. ˙Stop global warming for good! Esteemed leaders, words fall short of real meaning in this urgent situation of our planet and all life thereon. I pray that you will try your best to implement these necessary next steps to help fellow citizens, the animals, and the environment—and implement them now. For thus saving their lives and bringing peace and harmony to our world, the people's gratitude to you will know no bounds, now and in future history, as shall be Heaven's immense reward for you in the hereafter. Please, let us be unprecedentedly courageous for our children's sake. Thank you for your attention and noble spirit.